Your script has been carefully crafted… maybe edited and revised more times than you can count! Now it needs to find its voice; the element that takes your creative vision and breathes life into it. That’s where I come in…to create the sound you envisioned. 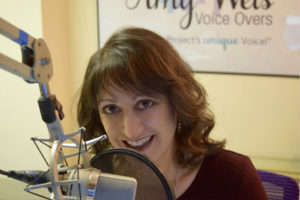 With years of voice over experience as well as a background in copywriting, media planning/buying, and radio sales, I have a unique perspective and insight into the creative and strategic process and a sincere commitment to your project’s success. When you choose me to voice your project, you can expect excellent service, attention to detail and an overall experience that makes your job easier. I absolutely love voicing projects, and you can hear it in my work. It’s easy to contact me for a quote or an audition. There are 3 easy ways to connect! Fill out this form and I’ll get right back to you! Send an email to amy@amyweis.com. Give me a call (513) 508-0850. My goal is to work with you and get you the polished, professional audio you need…QUICKLY! My passion is to make sure that the end result is just what you envisioned. Thanks for your interest; hope we’ll collaborate on your next project!